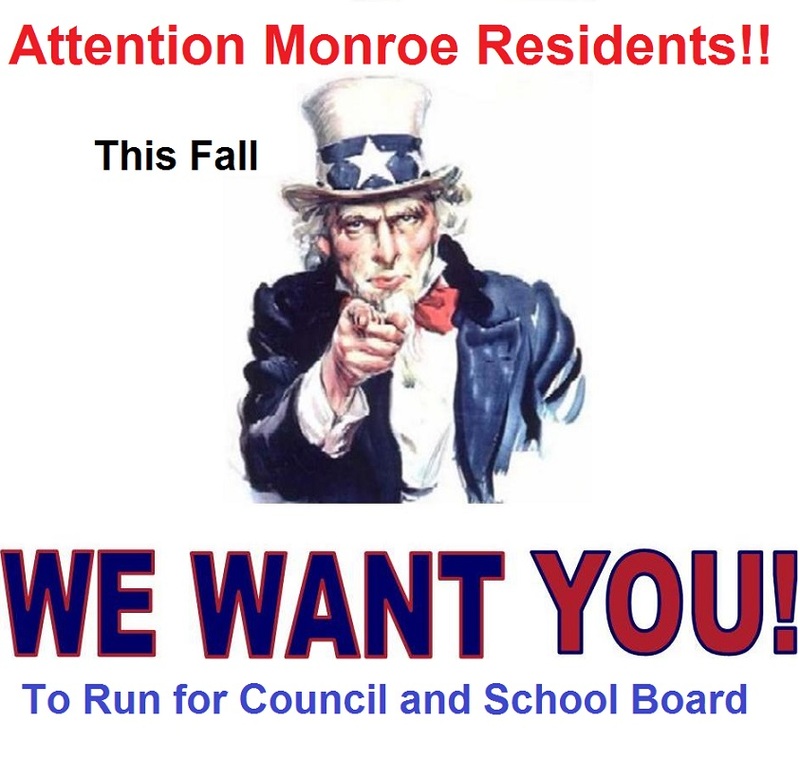 In November, we will elect members of Monroe City Council, Monroe School Board, and Lemon Township Trustees. For all those who seek something different, or want to make a difference, this is your chance to have real impact on the direction of local governments. To run for office, simply drop by the County Board of Elections, get and fill out the form, get 25 registered voters to sign your petition, and file it by August 7th. That is all it takes to be on the ballot. Monroe Local Schools is on track to recover from fiscal emergency. The funds misspent from the bond retirement fund are being repaid, and will be 100% repaid within five years. However, I am concerned about the district’s future. The greatest risk to the school financial plan is a return to high rates of enrollment growth, as the district does not have sufficient revenue or facilities to absorb much growth. I believe that the district is operating at unsustainable fiscal levels today. In just one example, we have just ½ of a person doing the curriculum development for elementary grades. There is a constant turnover of material, as changes are made in Ohio law, and by the state school board, as well as in federal requirements. Other districts use multiple people to do so. Again that is just one example. Even worse, new homes are being constructed all over town. It remains unclear if they will sell but given that builders are investing so much money, I would not bet against them. The district started in 2000 with 17% of the tax base of Middletown-Monroe Schools, and only 11% of its students. Since then enrollment has more than doubled, while revenues increased only 60%. The next school board will face large decisions, specifically when to build a new school to deal with the enrollment these houses will cause. Start to finish, the process will take four to five years. The good news is that we will get far more state support than when we built our 2004 building, at least 26%. One of the most common questions I am asked is "What is Lemon Township?" Nearly everyone in Monroe lives in and pays taxes to Lemon Township. Only those living in just a few blocks, in the extreme southern part of the city do not. Lemon Township has significant funding problems. Many say “Get rid of it!” But alas things are not so simple. Today, virtually all of Lemon Township’s tax revenues goes to the city, as they provide its road maintenance, police, ambulance, and fire protection. If Lemon Township goes fiscally belly up, and it is merged with Liberty Township, both city and schools will have large problems. Today, the city gets almost all of Lemon Township’s tax funding. Liberty Township is under no obligation to continue this payment. In fact, they don’t need to. With or without funding, Ohio’s Emergency Responder Laws will require Monroe to respond to any emergency, as its resources are closer than Liberty Townships. Thus Monroe would be stuck with paying for police, fire, and EMS in the former Lemon Township, but get no money to do so. The only way to avoid this is for Monroe to merge governments with Lemon Township. Several city council members say Monroe will not support such a merger. Our schools would suffer a more subtle, but still very real problem. Historically, Liberty Township has tried to avoid letting multifamily housing be constructed there, because of the negative impact on Lakota Schools. But consider a future merged Lemon and Liberty Township. Whenever someone wants to put multifamily housing in their jurisdiction, the township will be able to push it just across a dotted line on a map, right into Monroe Schools. Think it won’t happen? Call our former superintendent Arnie Elam and ask him. For Springboro Schools are doing exactly that to Franklyn. Liberty Township officials have no historical ownership in Monroe Schools, but do in Lakota. For both city and our schools, growth on the east end is a major concern. The Racino on the city’s east end will open next year. Unfortunately it is not within Monroe city limits, or within Monroe’s school district, so neither local government will receive taxes from it. Even if the Racino and the city agreed on its annexation, it will never be be within Monroe School District, even though chances are much greater that growth will occur more in our district than Lebanon’s. They are still angry that we took a small corner of their district when ours was formed. Even worse, our schools will receive very little business tax growth at all, for a very long time, because of the huge amount of 100% abated property being available. As I said, this will be an important election. I hope more people will run than is historically the case. Tom Birdwell - Opinions written here are mine alone, and may not reflect the views of other school board members. Hmm interesting post, thanks Tom! One question (at the moment): You say that several council members say that Monroe won't support a merger with Lemon Township. What are the reasons for this (if known)? Are there a significant drawbacks with this approach? I'm not too concerned about the chances of it happening but more so the reasons against pursuing it. Based on your view stated above, it seems like this would be course worth pursuing. I know of several Lemon Twp. residents that do not want to pay the city tax. That is why they would not support the merger. Also there was a merger on the ballot several years ago when all the annexation was taking place and it was defeted. One other item to consider was when Monroe and Middletown negotiated the annexation attempts they make a pact that Monroe would not go any farther north than the line where Garden Manor and the church across the street is in the City of Middletown. Middletown was supposed to annex the 'Cox' area which is their name for the area north of Garden Manor buy there was not enough income at the time to pay for the costs to do so. I do not know if that has changed since that time due to some of the develoment in that area. As for the law of Emergency Responders that Mr. B is talking about I do not know of any law that forces an area to protect the district of another area just for the reason that they are 'closer'. Now mutual aid pacts may include such items in them but there is no Emergency Responder law that forces them to do so. In fact there are some cases being litigated in other states where a nearby fire department responded to a fire but since they had failed to pay the required fee the firefighters watched the home burn. Monroe police and fire go at least as far north as The Moose. The reason they stated was that Monroe police spend a LOT of time supporting the extreme edges of Lemon Township, and they did not with to do that forever. They didn't give a reason, but there are trailer parks at both northwest and southwest extremes, and I suspect they constitute the majority of the expense they were speaking of. They expressed interest in selected parts of Lemon Township, the Rt 63 and Rt 4 corridor. If I was on the city council that is what I would push for. The Lemon Township residents I know want to leave things as they are. I don't blame them, for they get Monroe services today, but don't pay income tax. It is a great deal if you can get it. However, while Monroe agreed to reduce the amount Lemon Township pay for support this year, it is not sustainable in the long term. When the crunch comes, the majority of its residents may face the choice of going into to Monroe or going into Liberty Township. Just keeping things as they are may not be a choice in the future. In the past Monroe officials have indicated they might be willing to grant a waiver to city income taxes for current residents of Lemon Township. That would be the best of both worlds, but I certainly don't know if that will be an option forever. Monroe is looking to have future commercial developments within the city along 63 and Rt 4. As for annexation of the north end, the agreement with Middletown will probably stand. Really what we are speaking of here is Garden Manor. Our school district boundaries would stand as they are probably, as they don't change with annexation. So long as the trailer park near Kroger at Ingle's corner goes with Garden Manor, I suspect the city would honor the agreement with Middletown. I am not an expert on Ohio Laws for emergency first responders, but the fire chief and city manager both believed they they will have to provide coverage for any area they are closer to than for example, a future expanded Liberty Township. Furthermore, the city manager believes the city will be forced to provide support for the Racino, regardless of if it is in the city or not. I suspect they are working on a non-tax solution for it. That would be payments to the city outside of its present tax agreements. By the way, one of the stated reasons the city did not support the extension of 63 to Oxford was that a bridge there would result in Monroe being the closest fire department for a big area on the west side of the river, and the associated costs they would incur. Perhaps the city can convert back to a township so we all can pay no income taxes. On a serious note.... we do need good people to run for office. Who on council is up for re-election? Thankfully, Lemon Township pays for the services that they receive due to an annual contract that we have with them. We just went through the effort of recalculating the actual costs of those services to ensure that our expenses are covered. However; Mr. Birdwell is correct in his assumption that, if the contribution from the state to the township remains as-is, the agreement will eventually become unsustainable. The cost of government for the small township (salaries, benefits, services) appears to be more than Lemon can support in the long-term. As for now; If we did not have this contract agreement in place we would still provide emergency services to the township due to mutual aide agreements that we have with surrounding jurisdictions. Mayor Routson, former Vice Mayor Anna Hale and former school board member Suzi Rubin. Suzi is not up for re-election this year. Suzi, Lora, Bob K, and I were re-elected in 2011. It's Bob R., Anna, and Todd this time around. However... if you're looking to run against someone who is hands-down beatable - Wait till 2015 when MY term is up. Thanks for explaining Doc. I figured it had to be mutual aid that required the response. Now if the city withdrawals from the township the township will no longer be able to exsist due to size restriction and the remaining sections would then be divided into the surrounding townships and municipalities and then they would be responsible for the public safety coverage. The monies still in Lemon Township coffers would be used to pay any remaining debts from the township and then any left over would be also be divided into the surrounding areas that absorb the remaining portions of the township. Is this not correct and has this ever happened in Ohio before? Emergency Services "Withdrawal" from the township is not possible. We will be providing care to the township (or whatever if becomes) no matter what. We would be the closest responding political division. It benefits us to keep things at the status quo. The only scenario that would be more beneficial would be for Lemon Township to become part of the City of Monroe. I was not talking about just withdrawing emergency services. I was talking about the city withdrawing all the property now within the city limits. This would give the city all the tax money from those areas instead of paying a portion to the township. Would that option make it worth while? Could Bob Kelley become Mayor after this upcoming election? Is it possible? In the newspaper articles about the decline of townships, the Journal reported that if Monroe city pulled out of Lemon Township, that it would fall below minimum size, and would very shortly afterwards be broken up, unless a merger with the city was approved. In his post above, Doc states that today's situation is preferable to having the township broken up, and its tax income split among Liberty and Madison Townships and Monroe. Why? Because even though it passes through the townships hands, most of the money ends up in Monroe city coffers anyway, via the payments for services that the city provides. Other than what township officials pay themselves, nearly all the money the township generates goes to the city. I guess that way they are getting all the money not just what would be in Monroe. But evidently the township is not collecting enough property tax to pay for the coverage for emergency services. If that is so then shortly the township will be bankrupt and it will have to dissolve anyways. Then the mutual aid pact will not be in place for the emergency coverage and the townships that absorb the areas will then be responsible for coverage and Monroe may have a new contract with them to cover the same areas. Here is a Middletown Journal that does a good job of explaining the issues with Lemon Township. This site describes just about every aspect of the township. One of the graphs on this site shows the dramatic drop in the Lemon Township population, caused by the annexation of its areas. If Monroe pulls its areas out of the township it would no longer meet state requirements, and would probably be divided up, primarily into Madison and Liberty Townships, but the cities of Monroe and Trenton might get parts as well. Even if the state let the township remain, it would not have enough tax income to meet its requirements, leaving its residents with a choice of passing a levy for more funding, or dissolving the township. Going to the extreme, Monroe and Lemon Township could merge into one government, but both city and township would have to approve it. In a post above, Doc states that would be the best option for the city financially, but he is the first member of the council that I know of who has indicated he might support a complete merger. I will leave it to the city council members to explain why the city must provide the emergency services to areas outside the city, but it is important to note that that city leadership believes they will have to do so. In recent years, I have spoken to three council members, the city manager, the fire chief, and the Police Chief. They all believe they must do so, even if Liberty Township stiffs them and provides no funding. Finally there is one way to make significant cuts in the township budget. That is to reduce the amount the officials are paid. Its three trustees receive over $10,000 in salary, and its treasurer receives $16,000. They also are eligible for the state's retirement system if they complete two terms. The township also pays for health insurance, which can cost more than $10,000 per year per person. I don't know how many accept the insurance today but in past years half of them did. Just because the state sets the amount township officials are paid, they can refuse to accept that much. Combining the salary and insurance, its trustees receive up to $20,000 in salary and benefits, and the treasurer receives up to $26,000. If they meet once a month, the latter is $2,166 per meeting. For reference, school board members receive $125 per meeting up to a maxiumum of 24 meetings, totaling no more than $3,000. The city council receives a similar amount. Neither provides health insurance or retirement programs. The school board met 44 times in 2012, 20 of them unpaid. It sounds to me that they don't want to give up the goose with the golden eggs. Mebbe Danny Picard would be a good Munroe City counselman. Oh, no. even tho his office is here in Munroe, he's runnin fer counsel in Middletown. Aint life strange? I guess his goose lays golden eggs in moor places than one. Who is "they"? The residents of the township, who don't pay city income taxes but get city services? Or the city, that is better off with the township staying as it is today, than seeing it dissolved, and no longer getting the township's property tax money to support emergency services in the township? For if the city continues "mutual aid" agreements with other area agreements, it is significantly better off today, then in a future where Lemon Township no longer exists, and Madison and Liberty Townships don't cough over large amounts of money as Lemon Township does today. The real loser in this no matter how it turns out is the school district. Just look at what Springboro is doing to Franklyn today, pushing its problems across a dotted line into another school district. The 'They' is the trustees that get their insurance and get paid for doing a job that most people do for free. I don't see how it can make that much difference in getting all the tax money from the area unless the city is 'gouging' the township for services it currently renders now. The city would collect all the taxes and not have to pay the money to the trustees or buy their life insurance. Trenton or Middletown would most likely be the service provider of the Excello area and Monroe would just cover the areas south. So they would not be making as many calls. As you stated earlier the residents don't have to join the city. Thus they would continue to get the services the city provides, but the taxes would go not to the city, but to the townships the areas are in. The city of Monroe, for many other reasons would still have the costs because of the mutual aid agreements. What about this is not clear, that you don't see this as very bad for Monroe. City Council members have stated it here on the Voice, the city manager will explain it to anyone who will listen, and I am explaining its potential negative impact on the district. The only good outcome here will be if Monroe and the residents of Lemon Township agree to bring it into the city, and I am not sure either is willing to do so fully. I am not sure about the school taxes but I do know that the city tax payers are subsidizing the services that Lemon township receives. Lemon twp threatened to leave and go with Liberty twp at a cheaper rate for their annual cost and Monroe city council agreed to to take the lower cost even though it it does not fully pay for the services. The school is a whole different issue.